• 1942 ~ Glenn Miller and his band recorded the classic Jukebox Saturday Night for Victor Records. • 1952 ~ Singer Patti Page made her TV debut in a summer replacement series for Perry Como. The 15-minute program spotlighted Patti three times each week on CBS. 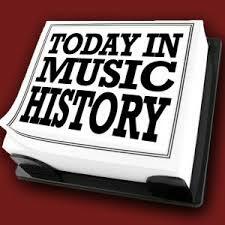 • 1966 ~ Singer Percy Sledge earned a gold record for When a Man Loves A Woman. It was his only song to make it to number one (5/28/66) and the only one of five to break into the top ten. • 1972 ~ Elton John landed at the top spot on the Billboard album chart for the first time as Honky Chateau made it to the top for a five-week stay. • 1978 ~ Bob Dylan performed before the largest open-air concert audience (for a single artist). Some 200,000 fans turned out to hear Dylan at Blackbushe Airport in England. • 2000 ~ Canadian baritone Louis Quilico, who sang many of the most famous opera roles, died after complications from surgery. He was 75. • 2000 ~ Singer Paul Young, who found fame with the band Mike and the Mechanics, died from what might have been a heart attack at the age of 53. The band just finished recording their fifth album and had planned to tour Europe this month. • 2001 ~ Denes Koromzay, a violist who helped found the Hungarian String Quartet, died at the age of 88. Koromzay studied at the Franz Liszt Academy in Budapest when composer Béla Bartók was on the faculty. Though trained as a violinist, Koromzay was the violist in the group that founded the Hungarian String Quartet in 1935. He remained with the famed ensemble until it disbanded in 1972. For the next seven years, he performed with the New Hungarian Quartet, an ensemble at Oberlin Conservatory in Ohio. Koromzay moved to Boulder in 1962, when the Hungarian String Quartet was named resident ensemble at the University of Colorado. He returned to the university to teach viola and coach chamber music in 1980. He retired from the school in 1996. This entry was posted in Composers, musicians, Pianists, Today in Music History and tagged Carl Czerny, composer, Glenn Miller, guitarist, lutenist, pianist, singer, Today in Music History, video, violinist. Bookmark the permalink.